Can't Find An Affordable Home? Try Living In A Pod Co-living projects are popping up in cities where housing costs are too expensive for middle-income residents. It's dorm life for adults, with shared kitchens and bathrooms, and it doesn't come cheap. 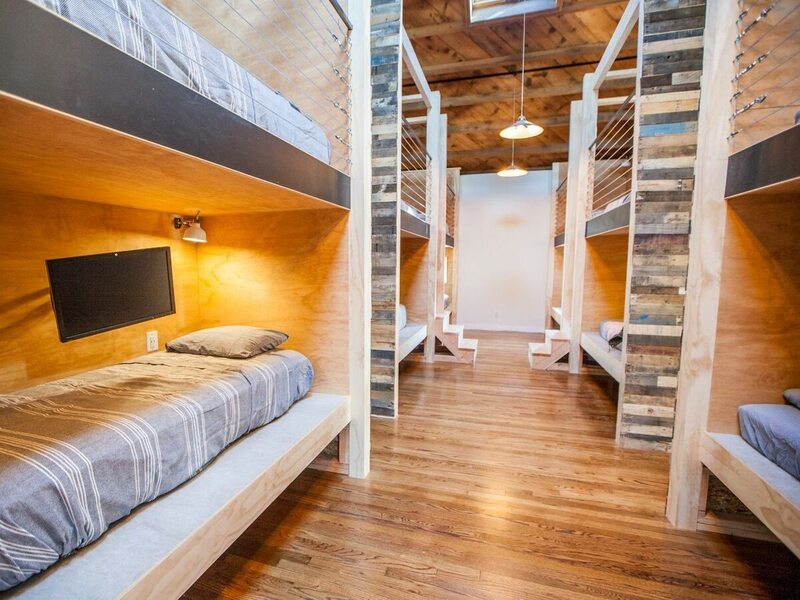 It's dorm life for adults: A PodShare co-living building in Venice Beach, Calif., where dorm beds go for about $1,400 per month with shared kitchens and bathrooms. The cost of housing is out of reach for many residents in cities such as Los Angeles and Seattle. One solution is called co-living, and it looks a lot like dorm life. Co-living projects are trying to fill a vacuum between low-income and luxury housing in expensive housing markets where people in the middle are left with few choices. PodShare, which opened its fifth location in L.A. this year, is part of a growing trend. It's one of several companies operating co-living buildings in the city. 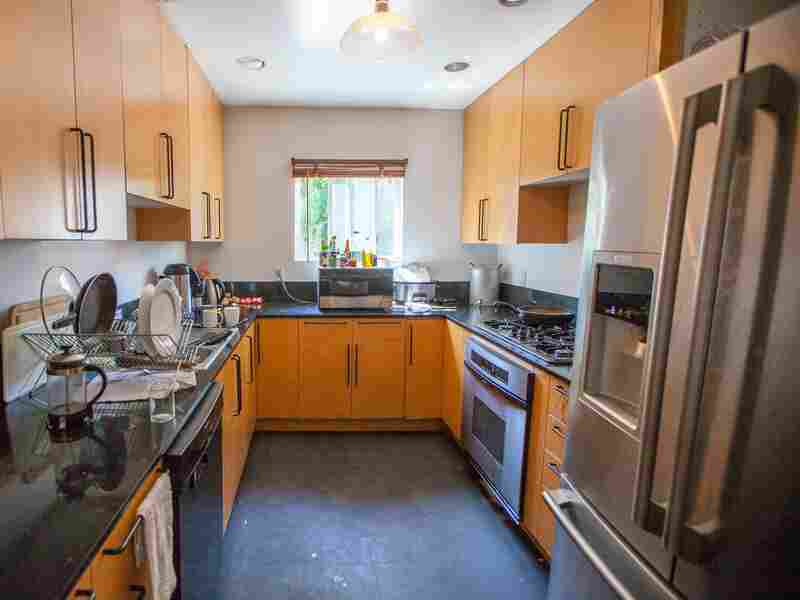 In these properties, tenants typically share kitchens, bathrooms and living rooms in exchange for cheaper rent. The co-living companies generally don't own the properties but partner with local developers to operate and manage them. On a recent afternoon, Dishotsky pushed open the door to the roof deck on the Venice Beach project and stepped outside. Lounge furniture was arranged around the roof, and the ocean was visible a block away. "We kind of have four different customer types," he said. "We have a 'starter,' who's just coming to a new city and wants to grab life by its horns. We have a 'restarter,' somebody who's 30 to 40 who maybe had a divorce or had a really tough roommate situation and is tired of running a home." The prices at Starcity's new L.A. building might be a good deal for Venice Beach, but they're not cheap. Rents will start at about $2,200 a month for dorm-like suites where renters get private bedrooms but share bathrooms and kitchens with one other unit and go all the way up to about $3,500 a month for traditional one-bedrooms. The building also includes some traditional studios. "We're very hyperaware of the fact that this is not a full solution for affordability," Dishotsky said. "We are working on that." Mike Liu, a 36-year-old PodShare member, agrees that embracing co-living is about socializing as much as lower rent. "There's always somebody new coming through, and that discovery feeling is always there," he said. He added that, among the longer-term residents such as himself, there's a sense of built-in friendship and community.